So the police chief famously informs the shark hunter, right after the first brief appearance of the man-eater in "Jaws." It's not simply a splendid line of dialogue, it's an example of Steven Spielberg's strategy all through the film, where the shark is more talked about than seen, and seen more in terms of its actions than in the flesh. There is a story that when producers Richard Zanuck and David Brown first approached Spielberg with an offer to direct the film of Peter Benchley's best seller, he said he would do it on one condition: that the shark not be seen for the first hour. Viewing the movie's 25th anniversary DVD, I was surprised to realize how little the shark is seen at all. In keeping the Great White offscreen, Spielberg was employing a strategy used by Alfred Hitchcock throughout his career. "A bomb is under the table, and it explodes: That is surprise," said Hitchcock. "The bomb is under the table but it does not explode: That is suspense." Spielberg leaves the shark under the table for most of the movie. And many of its manifestations in the later part of the film are at second hand: We don't see the shark but the results of his actions. The payoff is one of the most effective thrillers ever made. The movie takes place over the Fourth of July weekend on Amity Island, a tourist resort that feeds off the dollars of its visitors. 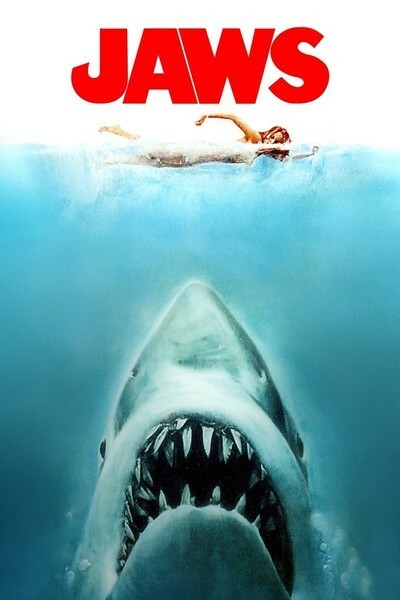 A famous opening sequence establishes the presence of a man-eating shark in the coastal waters; a girl goes swimming by moonlight and is dragged under, screaming. All evidence points to a shark, but Mayor Vaughn (Murray Hamilton) doesn't want to scare away tourists, and orders Brody (Roy Scheider), the police chief, to keep the beaches open. "If people can't swim here, they'll be glad to swim in the beaches of Cape Cod, the Hamptons, Long Island," the mayor tells Brody, who spits back: "That doesn't mean we have to serve them up a smorgasbord." But the mayor strides on the beach wearing a sport coat and tie, encouraging people to go into the water. They do, with predictable results. The third key character is Hooper (Richard Dreyfuss), an oceanographer, brought in as an adviser, and useful to the movie because he can voice dramatic information. ("What we're dealing with here is a perfect engine. An eating machine.") Brody is convinced the beaches must be closed and the shark killed; the mayor stalls, and then after the shark makes the TV news, a $3,000 bounty is offered, and Amity is crawling with reckless fortune hunters. It's here that Spielberg uses one of his most inventive visuals for suggesting the shark. Three or four men gather on a wooden pier, hoping to catch the shark. One has stolen his wife's beef roast to use as bait. They put a fearsome hook through the roast, fasten the chain to the pier, and toss in the bait. The shark simply pulls the end of the pier loose from its moorings and drags it out to sea. Effective, but even more chilling is the next shot, in which we see the floating pier turn around and move back toward shore. Floating objects are used all through the movie to suggest the invisible shark. After Brody, Quint and Hooper put out to sea in Quint's leaky boat, they fire harpoons into the shark. The harpoons are roped to floating yellow kegs, designed to tire the shark with their lift and drag. In the crucial action sequences at the end, we are often looking at kegs and not at a shark, but the premise is so well established that the shark is there. "I'm not gonna stand here and see that thing cut open and see that little Kintner boy spill out all over the dock." "I pulled a tooth the size of a shot glass out of the wrecked hull of a boat out there, and it was the tooth of a Great White." "The thing about a shark, he's got lifeless eyes, black eyes, like a doll's eyes. When he comes after you, he doesn't seem to be living until he bites you, and those black eyes roll over white. . . ."
After all of the shark-establishing and curtain-raising scenes, the heart of the movie is in the long passage at sea, where Hooper and Brody (who is afraid of the water) join Quint on his boat. Brody is right, they need a bigger boat. Quint's boat is terrifyingly inadequate, leaky, with an engine that produces clouds of black smoke, a bridge that seems designed to topple a crew member overboard, and a harpooning platform jutting out from the bow so that a man standing on it looks like an appetizer on a kebab stick. The best scene in the movie is the nighttime scene in the galley, where the men drink apricot brandy and Quint and Hooper compare scars. Finally Quint launches into a moody monologue, telling the World War II story of the sinking of the USS Indianapolis. He was one of its crew members. Of the 1,100 men who went overboard, he says, sharks ate all but 316 before rescue arrived: "They averaged six an hour." When the shark does appear for its closeups, it is quite satisfactorily terrifying, and most audiences are too startled to ask why the shark seems prepared to inconvenience itself so greatly, at one point even attempting to eat the boat. The shark has been so thoroughly established, through dialogue and quasi-documentary material, that its actual presence is enhanced in our imaginations by all we've seen and heard. Spielberg's first big hit contained elements he repeated in many of his movies. A night sea hunt for the shark provides an early example of his favorite visual hallmark, a beam of light made visible by fog. He would continue to devote close attention to characters, instead of hurrying past them to the special effects, as so many 1990s f/x directors did. In "Jaws" and subsequently, he prefers mood to emotional bludgeoning, and one of the remarkable things about the picture is its relatively muted tone. The familiar musical theme by John Williams is not a shrieker, but low and insinuating. It's often heard during point-of-view shots, at water level and below, that are another way Spielberg suggests the shark without showing it. The cinematography, by Bill Butler, is at pains to tell the story in the midst of middle-class America; if Spielberg's favorite location would become the suburbs, "Jaws" shows suburbanites on vacation. "Jaws" was released in 1975, quickly becoming the highest-grossing picture made up to that time, and forever wresting the summer releasing season away from B movies and exploitation pictures. The major Hollywood studios, which had avoided summer, now identified it as the prime releasing season, and "Jaws" inspired hundreds of summer thrillers and f/x pictures. For Spielberg, the movie was the launching pad for the most extraordinary directorial career in modern movie history. Before "Jaws," he was known as the gifted young director of films such as "Duel" (1971) and "The Sugarland Express" (1974), After "Jaws," "Close Encounters of the Third Kind" (1977) and "Raiders of the Lost Ark" (1981), he was the king.